Seven years ago, CORE agent, Dante Russo and his wife, Jessica, faced a parent’s ultimate fear…their ten-month-old daughter was abducted. With no clues, not a single sighting or trace of evidence to keep hope alive, the case went cold…until now. 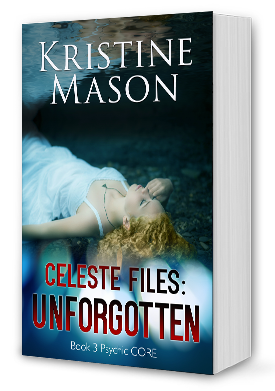 When the ghosts of murdered children begin to haunt psychic Celeste Kain, she’s forced to get involved in her most challenging case yet. The ghosts know who has Sophia. They know her kidnapper intimately. They know him as Daddy, and as their killer. Using psychic visions and the clues the young spirits provide, Celeste and her husband, John, travel across the country, desperately searching for the girl and her kidnapper. The dead children have made their warning clear…find Sophia before Daddy kills again. To learn more about Dante and Jessica’s story, be sure to check out Ultimate Fear (Book 2 Ultimate C.O.R.E. ).